Why would I need self storage in Mooresville, NC? There are a variety of reasons why you might need self-storage in Mooresville, NC. How much is a storage unit in Mooresville, NC? The cheapest storage unit in Mooresville, NC is $42.00 per month. What size storage units do you have available in Mooresville, NC? In Mooresville, NC we have sizes that range from 5'x5' to 10'x32' to suit your storage needs. How much is it for a 5'x5' storage unit in Mooresville, NC? The cheapest 5'x5' storage unit in Mooresville, NC is $42.00 per month. Widely known as Race City USA, Mooresville is a mid-size town about 25 miles north of Charlotte, North Carolina. It's home to a number of NASCAR teams and drivers, the NASCAR Technical Institute and many racing technology suppliers, all of which have earned the town an important role in the racing industry. In the 1700s, the first settlers arrived on the land that would eventually be Mooresville. English, German and Scotch-Irish families formed a small farming community that was named Deep Well for a natural well in the area. By the 1850s, many of the family farms had grown into plantations, primarily producing cotton. Mooresville got its start in the 1850s as a pivotal point on railroad as it increasingly dominated the American landscape. This, combined with the abundance of cotton crops, created the perfect conditions for several manufacturing companies to set up shop in Mooresville, particularly in the textile-production industry. D.E. Turner, a local businessman, established a hardware store in 1899, and many believe that it was his store that installed the first gasoline pump in the United States. Mooresville's proximity to Concord and Charlotte makes it an ideal place to settle down. You can enjoy the small-town atmosphere without sacrificing easy access to larger cities. The town offers many attractions to keep you occupied, such as the North Carolina Auto Racing Hall of Fame, the Memory Lane Motorsports Museum and the Historic Rural Hill Farm. 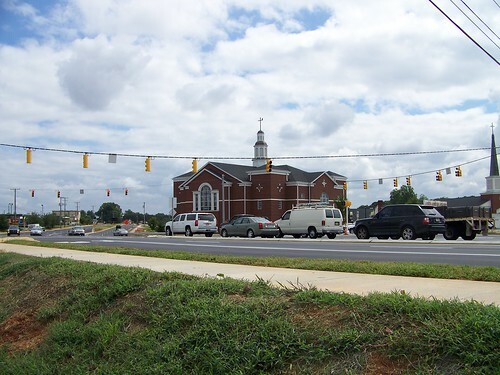 Despite its small population, Mooresville has a bustling commercial district that gives residents access to many amenities. Grocery stores, gyms, coffee shops and restaurants are all easy to find throughout the town. The town also has a low crime rate, which is a big plus for those living alone or with children. The Mooresville Graded School District operates most of the public elementary, middle and high schools as well as a technology and arts center in town. Iredell-Statesville Schools oversees a few schools in the area as well. There are a few private schools around town, mostly faith-based and associated with local churches. The town also has a small campus of Mitchell Community College. Utilities: The town utilities department manages water and sewer services. Duke Energy is the primary energy provider in the area. Garbage and Recycling: Curbside recycling and trash and yard waste collection are available for most single-family houses, town homes and duplexes in Mooresville. Transportation: The Iredell County Area Transportation System (ICATS) handles a network of fixed bus routes and on-demand transportation in Mooresville. Although Mooresville's median home price is above the national average, it's fairly even with those in Greater Charlotte. There are many different homes to choose from, including new construction, town houses, condos and more. Single-family homes range from cozy bungalows to sprawling lakeside estates and encompass just about everything in between. The rental market is also very well-rounded, with many of the apartment communities in Mooresville including desirable amenities. Our lowest priced units in Mooresville, NC average $50.00 per month. 86 people have reserved units in Mooresville, NC in the past 30 days. There are 2 locations within Mooresville, NC's city limits. There are 2 locations in Mooresville, NC that offer AC and Heating features.